The Queen Father: How do you take your culture darling? How do you take your culture darling? In our artistically-starved age where the likes of Damien Hirst, Tracey Emin and Banksy have more than convalidated the notion of "This is art 'cause I say so", a retrospective about John William Waterhouse at the Royal Academy was to me too great an opportunity to miss ( all the above is purely subjective by the way...). The place was packed, so I ended up leaving Gabriel and Steven at the bar, as the rooms were too crowded to be navigated with a stroller the size of a small 4x4. I felt a little guilty for about 4 seconds. I was finally husband-and-child-free to enjoy the company of my secret lover. Oh how I enjoyed the whole experience! The low lighting, the smell of the old canvases, the perfect shine of the glossed surfaces of the paintings. I didn't remember how vibrant Waterhouse's green is and how enthralling. If you get close enough to one of his canvases and if you get as engrossed in them as I usually do, I guarantee you can almost smell the grass, the leaves, the flowers, the intoxicating scent of his beautiful women. Born in Rome in 1849 from english parents, both of them painters and relocated to Italy to pursue their passion ( how hippy is that by the way? 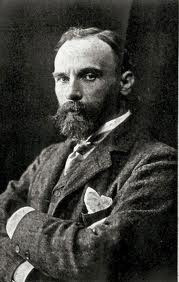 ), Waterhouse is mistakenly considered as one of the most prolific exponents of the Pre- Raphaelite movement, when he is in fact a Neoclassical painter. Because his material and subjects of choice are usually taken from medieval and classical mythology, the wider public is led to this conclusion. We can safely say that this is one of his trademarks: Waterhouse's painted ladies are stunning. After closer observation though, I came to realize that there is a recurrence of facial features which led me to think that maybe, rather than real life models, his tragic and dark heroines were an idealised version of woman. Perhaps betraying a certain snobbery in his part. I love him. In an era that saw the likes of Lizzie Siddal becoming the official muse and face of the Pre-Raphaelite movement and, un-officially, Britain's first Supermodel (take this Tyra...), Waterhouse went on to imagine an array of beautiful and dangerous women: Nymphs, Syrens, Mermaids, Witches and Enchantresses. In their realm, the man is almost always the willing victim of their dark, inescapable powers. We can find examples of this in paitings like " La belle dame sans merci" and "Hylas and the Nimphs", in wich Waterhouse captures the exquisite moment of man's capitulation. Whether he is falling victim of the bewitching eyes of an apparently defenceless damsel, or about to be dragged to the murky depths of a pond by alluring Nimphs. 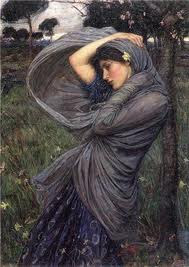 Waterhouse is drawn to the dark side of femininity, to its mysticism and supernatural qualities. Quite a distance from the real social standing of women in the Victorian age, when they were trapped in the very fabric of society, by marriage, status and etiquette. There is another woman in his production though. She is no man-eater of sort, she is a vanquished heroine facing a gloomy end; she is a woman under a curse. In paintings like "Mariamne" and, more prominently "The Lady of Shalott", Waterhouse, using the tennysonian poem as a subject platform, goes to expose another more truthful reality: the woman trapped in a destiny she has no control over. 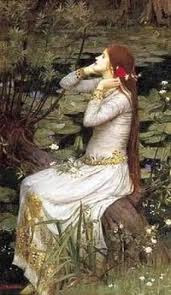 In "the Lady of Shalott" (from the famous tennysonian poem..) she dared to love and now she must die, in "Mariamne" she is victim of an injust verdict and the dark machinations of a masculine world. She walks towards her doom, looking back at her enemies, defiant, but, nevertheless, defeated. Waterhouse gives us a woman, permanently trapped in a tragic dichotomy: prey/predator, where the driving force is her misticism-infused sexuality. Once she is a beautiful dangerous dark angel, that promises to reward us with delights for the price of one single kiss, that very kiss that will seal forever our fate as her victims. It's last century's "femme fatale". Then she becomes a dark heroine tied to her tragic fate, a woman that disappears, consumed by her own audacity. Darkness permeates all of Waterhouse paintings, a watery, deep darkness, the darkness of a longing heart that is never appeased, the darkness of a veiled danger, of an old fairytale. 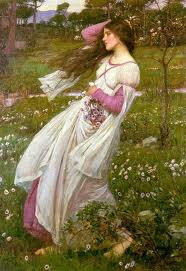 As with most of other Pre-Raphaelite painters, Waterhouse's work is, for the most part, privately owned, making therefore very difficult putting together an exhibition of decent scale, that's why I jumped at the chance to visit the Royal Academy in september '09 and was thrilled by the number of pieces on show there and by the huge turnout of visitors. I am a devote fan to this master's work, to his love for antiquarianism, his love for detail and the hypnotic beauty of his women. I hope my little one will grow up to appreciate art as much as I do, as long as is not Tracey Emin's. She just made a big deal out of her messy bed. In the meantime, I can only brainwash him.... And drag Steven around. do you remember? "tutti cazzi....."
Tata che ricordi.... Ma erano in fondo "tutti cazzi".. No? Sto ridendo che non ci vedo neanche piú..... Io e l'arte moderna proprio nun se piamo.... Allora come adesso... Tutti cazzi.